The leaves are starting to turn, weather is starting to cool & nothing says Fall like my Grandmother’s recipe for creamy & comforting Butternut Squash Soup! I had a hard day, so my Mom whipped this up & had me over for dinner. Thank you, Mommy Cat…totally hit the spot! Cook garlic & onions in a stock pot in 2 tbs of butter, about 5 minutes. Stir in carrots & celery. Cook & stir about 5 minutes or until just tender. 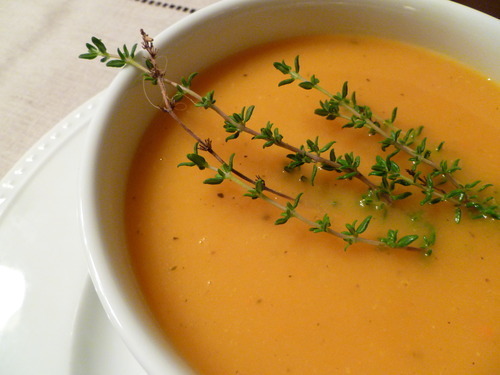 Stir in potato, squash, broth, honey & thyme. Bring mix to a boil; reduce & simmer, covered for 30-45 minutes until vegetables are tender. Remove from heat & cool slightly. Put in blender, food processor, or use an emulsion blender & process until smooth. Season to taste with salt & pepper. Garnish with fresh thyme.